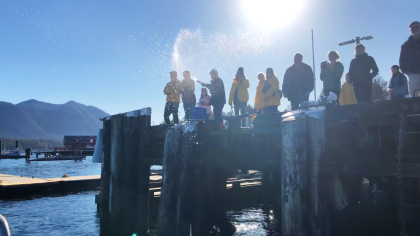 Earlier this week, dozens gathered on the main wharf to witness the annual tradition of boat blessing. On the calm waters of the Tofino Harbour, vessels of all sizes lined up to receive a splash of holy water via squirt gun. The super soaker adds a twist to the tradition and a touch of humour but whether you call it religion or superstition, this ceremony is taken very seriously by those who float on our West Coast waters. With Captain Josh at the helm, the Blue Pearl cruised beneath the local pastor as he said a prayer, blessing the Long Beach Lodge boat for the upcoming adventure tour season. According to Wikipedia, the Blessing of the Fleet is a ritual that goes back centuries and is practiced in communities around the world. Although each event varies in ceremony, the core is consistent; ensuring a safe and bountiful season to all.